A child sitting at a desk in a school that was attacked, in Idlib, Syria. 2016. A deal reached between Russia and Turkey to create a demilitarized buffer zone protecting citizens “from catastrophe” in Syria’s Idlib region is a welcome development, UN Secretary-General António Guterres said on Thursday, before urging all parties to make a “strong commitment” to it. “I welcome the agreement three days ago between President Erdogan of Turkey and President Putin of Russia, to create a demilitarized buffer zone in Idlib”, Mr Guterres told journalists in New York. In his appeal to “all the parties” to implement the agreement, the UN chief highlighted the need to ensure the protection of civilians and humanitarian access. Mr Guterres’s comments followed a meeting earlier in the day of the Humanitarian Access Task Force on Syria, led by Senior Adviser to the UN Jan Egeland. Echoing the UN chief’s comments, Mr Egeland said that the deal between Russia and Turkey was a welcome development, before appealing to armed militants there not to fight “to the last civilian”. “What some groups have said is that they are preparing to fight,” Mr Egeland told journalists in Geneva. “And our message to them is…we hope you’re not going to fight to the last civilian”. After meeting with more than 20 Member States, Mr Egeland explained that the fine detail of the freshly-inked deal had yet to be decided. It was essential that the aid lifeline from Turkey to Syria “must not be cut” by fighting “that could still happen” as part of this agreement, he said. 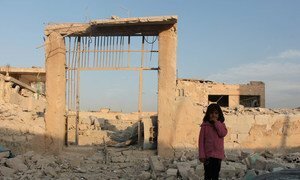 Insisting that the “ruthless and reckless armed groups” which had committed crimes in Syria should not escape justice, Mr Egeland said that he hoped interlocutors would offer them alternatives to fighting. “The listed organizations, terrorist organizations have many, thousands and thousands of fighters…. They are in many parts of Idlib,” he said. “And among them are many who say they would fight until the end, and that is very, very worrisome." With so many armed groups there vying for control, the Senior Advisor to the UN called on Member States reiterated that it was a “war crime” to blend into civilian populations and to locate next to homes, schools or hospitals. Also in Geneva, the head of the UN-appointed International, Independent and Impartial Mechanism (IIIM) into the worst crimes committed in Syria announced that there had been “far too few” judgments made against perpetrators to date. Criminal investigations taking place in a number of countries - notably in Europe - were “undeniably a source of hope” for victims, Catherine Marchi-Uhel told journalists. “But the road is still a long one,” she added, noting that “the large majority” remained “disillusioned” by the absence of the possibility of justice for them at an international level. After starting work on evidence-gathering earlier this year, the Mechanism has so far collected almost 900,000 records, the equivalent of four terabytes of data. This includes “high-value” testimonies gathered by other UN accountability bodies such as the Commission of Inquiry on Syria, Ms. Marchi-Uhel explained, adding that the Mechanism also engages with national war crimes units in various States and with Syrian non-governmental organizations. To date, the Mechanism has received seven requests for assistance from national prosecutors. It expects to open “two or more specific investigative case files” before the end of the year, the IIM head said. 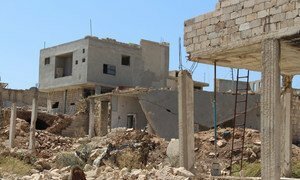 The agreement between Turkey and Russia to create a demilitarized buffer zone protecting civilians living in Idlib, Syria, has been welcomed by United Nations Secretary-General António Guterres and the world body’s humanitarian chief, who called on all warring parties and countries supporting them to make it effective.